With over 20 years of experience in software development and over 100 million users worldwide, Nero Software is a brand you can trust. 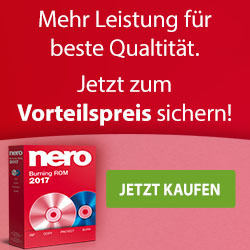 Get your copy of the best computer software that Nero has to offer - the Nero Platinum Suite. Nero TuneItUp speeds up your PC, updates drivers and increases internet speed so you can surf the web faster. Nero TuneItUp PRO puts you back in control and lets you solve problems individually, or repair them all at once. The automatic monitoring feature will notify you immediately when PC problems are detected, so you can keep your PC in top shape. Clean, optimize and speed up your PC like a pro! Boot Windows faster. Surf the WEB faster. Optimize your Windows. 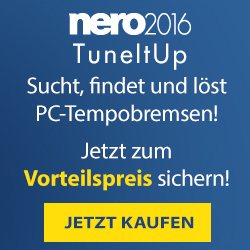 Nero TuneItUp PRO - 1-year license/yearly subscription - Clean, optimize and speed up your PC like a pro! 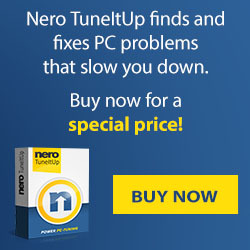 ​Nero TuneItUp speeds up your PC, updates drivers and increases internet speed so you can surf the web faster. Nero TuneItUp PRO puts you back in control and lets you solve problems individually, or repair them all at once. The automatic monitoring feature will notify you immediately when PC problems are detected, so you can keep your PC in top shape. Nero Recode 2019 - Rip and convert: Nero Recode converts videos, so you can access them from anywhere with your smartphone or tablet. 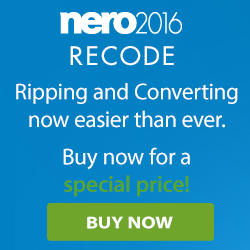 Nero Recode - "the Geek" for Ripping and Converting: Want to rip a Blu-ray Disc™ or DVD for your film library, convert a video so it can be played on your tablet, or make music tracks playable on your smartphone? Then sit back and relax: Nero Recode makes child's play of ripping and converting and ensures top quality results for all devices. ​Nero 2019 Video - Video editing and streaming: With its ability to simply import photos and videos from almost any device; edit with the aid of cutting, text, image, and sound effects; create DVDs, AVCHDs, and Blu-ray™ Discs; and play back and stream images - Nero Video 2016 is the powerful all-rounder for your next movie project. Use Nero Video to edit and create videos (4K) and stream videos from you smartphone to your TV. Test your free trial version now! ​Official Nero Downloads | Free Software Trials and Updates: Download free software trials or find free updates for your Nero software from Nero 12 over Nero 11 to Nero Burning ROM, Nero BackItUp or past products. 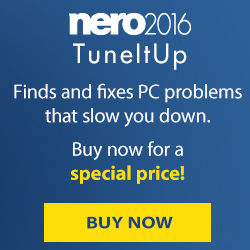 Nero TuneItUp - Clean, optimise, and speed up your PC like a pro! Nero 2019 Video - Download Now! ​Nero 2019 Video - Download Now! Nero 2019 Video - Video editing and streaming: With its ability to simply import photos and videos from almost any device; edit with the aid of cutting, text, image, and sound effects; create DVDs, AVCHDs, and Blu-ray™ Discs; and play back and stream images - Nero Video is the powerful all-rounder for your next movie project. Use Nero Video to edit and create videos (4K) and stream videos from you smartphone to your TV. Test your free trial version now! Nero Burning ROM 2019 – The elite of burning software! ​Nero Burning ROM 2019 - Best-selling burning program: Need to copy, import, edit, or back up your files long term? Nero Burning ROM can do all that and much more. Thanks to the very best burning technology and a variety of both new and longstanding functions, you can turn CDs, DVDs, and Blu-ray Discs™ into personalized keepsakes in just a few moments. Use Nero Burning ROM to burn CDs, convert WMA to MP3, copy and archive important data permanently plus much more. Test your free trial version now!